Sanford, Florida (CNN) — Attorneys for neighborhood watch volunteer George Zimmerman, who authorities say fatally shot an unarmed teenager in Florida, said Tuesday they have lost contact with their client and no longer represent him. 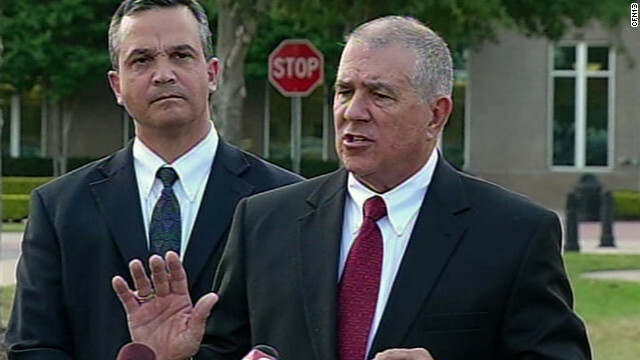 Sonner, who said they last were in touch with Zimmerman on Sunday, spoke to reporters in Florida with attorney Hal Uhrig. Uhrig said Zimmerman had, on his own, called Sean Hannity of Fox News and the office of the special prosecutor appointed to lead the investigation. Uhrig also seemed to suggest that Zimmerman had left the state of Florida. “I still believe that he was acting in self-defense that night. Nothing that I’ve said about him, or this case, has changed in any way,” he said. Uhrig similarly defended his former client on CNN’s “AC360˚” Tuesday night. “We believe in his case; we believe in his innocence. We were prepared to defend him all the way. But we simply cannot defend somebody who won’t communicate with us and who is off the reservation talking to people we’ve advised him not to talk to,” he said. Tuesday night, Hannity confirmed he was in fact contacted by someone he believes was Zimmerman. They spoke on the phone and Hannity agreed not to report on the “contents of that conversation,” he said. Although details of the February 26 incident remain murky, what is known is that 17-year-old Trayvon Martin, an African-American, ventured out from his father’s fiancee’s home in Sanford to get a snack at a nearby convenience store. As he walked back with a bag of Skittles and an Arizona Iced Tea, he was shot and killed by Zimmerman, who is Hispanic and who had called 911 to complain about a suspicious person in the neighborhood, according to authorities. Zimmerman told Sanford police the shooting was in self-defense. The fact that he has not been charged with a crime has provoked demonstrations and calls for his arrest. Martin’s death has triggered a nationwide debate about race in America and Florida’s “stand your ground” law, which allows people to use deadly force anywhere they feel a reasonable threat of death or serious injury. Meanwhile, a friend of George Zimmerman took issue with how his former attorney characterized his mental state. Special prosecutor Angela Corey has not indicated when she will decide whether to file charges against Zimmerman. But on Tuesday, she said she is preparing to release new information on the investigation and will hold a news conference within the next three days. Corey, assigned to oversee the investigation, announced Monday that she would not present the controversial shooting case to a grand jury. A grand jury set to convene Tuesday was canceled. “The decision should not be considered a factor in the final determination of the case,” Corey’s office said. Zimmerman recently launched a website to warn supporters about groups that falsely claim to be raising funds for his defense and to solicit donations for himself. “The support has been overwhelming in volume and strength. I thank you all and ask that you permit me the time to respond to each one of you personally,” he wrote on the site Tuesday. Zimmerman’s now-former lawyers and friend Taaffe confirmed the authenticity of the website, which was set up over the weekend. Fulton said Tuesday that Zimmerman has the right to launch a website, but Martin said he feels Zimmerman is raising money off his son’s death. Crump, the lawyer for Martin’s family — which also has a site raising funds to support its efforts — said it’s unfair Zimmerman remains free to express his views and solicit money. After the shooting, Sanford police questioned Zimmerman and released him without charges. Authorities have said Zimmerman was not immediately charged because there were no grounds, at the outset, to disprove his account that he’d acted to protect himself. Thousands of people have converged on Sanford to join in protests calling for Zimmerman’s arrest and criticizing the police department’s handling of the case. A marked Sanford police car was shot several times early Tuesday, authorities said. The car was parked in an elementary school parking lot “as a visible deterrent due to tour buses using the school property to park during the day and evening hours,” according to Sanford police spokesman Sgt. David Morgenstern. The buses have been frequenting the area since the shooting, Morgenstern said. The vehicle was unoccupied at the time of the shooting, thought to have been at about 4:30 a.m., police said. Residents called authorities to report shots fired, Morgenstern said. Glass was shattered and the car’s body was pierced. Police were inspecting the vehicle in an evidence processing unit, he said. The shooting was the first violence reported that may have been related to Martin’s death, Morgenstern said. No one was hurt and the shooting is under investigation.